Pinterest has been the latest craze in social networking. According to site analytics, Pinterest popularity has exploded from 1.2 million users in August, to over 7 million today. The budding social network has proven to be more than a fad, gaining over $27 million in venture funds. Pinterest is a virtual pinboard that lets users organize and share images that they find on the web. Pictures, or pins, are organized onto boards that categorize them into themes. The pictures then link back to the original site where users can find more content. To learn more about the network, Mashable’s Pinterest: A Beginner’s Guide is a great resource. Beyond its mainstream appeal, the network has the potential to be particularly valuable for green businesses. Organizations undertaking green initiatives are constantly trying to make environmentalism fit within the larger scope of business. Pinterest is the perfect platform to visually show the many facets of their brand personality. More specifically, it allows businesses to engage their stakeholders while displaying how their environmental consciousness fits into the mix. What better way to encourage reuse than through creativity? DIY pinboards hold great value for green businesses creating a Pinterest presence. These boards allow users to upload pictures of ways to reuse products. For the fashionista, what better way to recycle old T-shirts than to make them headbands or scarves. Encourage Home décor enthusiasts to make wreathes out of the packaging materials of your product. Rather than contributing to the cycle of consumption, this creates a mindset of reuse and environmental consciousness. It is unlikely that being green encompasses the entire personality of a brand. However, if the organization is making environmental strides then it should have at least one environmentally inspired board. Pins on that board should be eye-catching and provide interesting content. Give users an incentive for following the brand by allowing them to contribute to select boards. This is a great way to build relationships with pinners that are influential about the environment. You can gauge a pinner’s influence by looking at the number of people that follow their boards. Also, it can be a way to reward Pinterest users for liking and commenting on the organization’s pins. 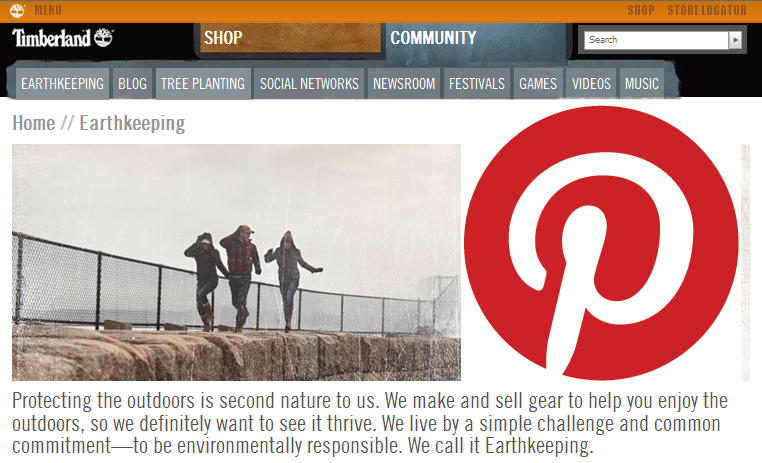 Linking the pins to sites is a great way to drive traffic and raise awareness of environmental issues and initiatives. It is important to remember that Pinterest etiquette clearly states that it is not a platform for self-promotion. Make sure the picture and description clearly represent where the link will take you. No one likes to be deceived or spammed. Green businesses have the opportunity to engage their stakeholders with innovative Pinterest challenges. After unsuccessfully trying to find examples of green businesses taking advantage of Pinterest contests, I came up with a few ideas of my own. Jones Soda could challenge users to pin pictures of their most creative ways to reuse soda bottles. Timberland is currently running a social media campaign dedicated to “Earthkeeping.” The footwear giant could inspire pinners to upload pictures of footprints in the destinations that they hope to protect. Attention anyone who is involved with green business! Here are some great tips to utilize pinterest to market your business.